The yarn, she is no longer cursed. It loves being a baby blanket that is about to be shipped off to Afghans for Afghans. 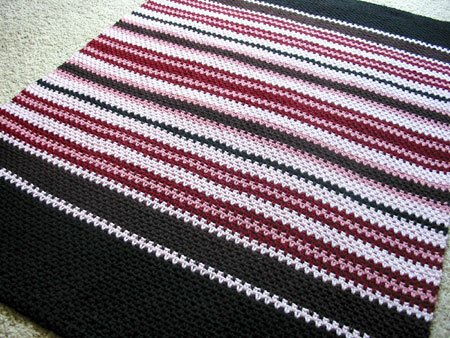 The finished blanket is baby-sized, about 34″ x 46″. 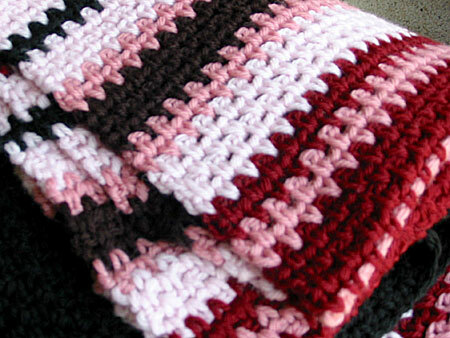 I used a different stripe sequence than what’s in the pattern to accommodate the amounts of yarn I had. Stripe sequence after the jump. This is the halfway point. 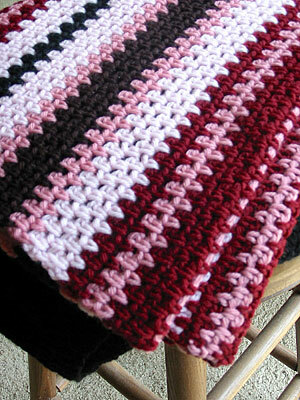 Reverse the sequence to make the second half of the blanket mirror the first half. 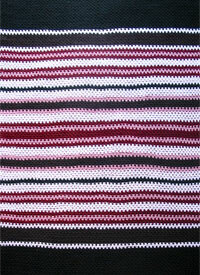 CogKnition posted this on May 9th, 2009 @ 3:56pm in Baby Items, Blankets, Crochet, Knitting for Charity | Permalink to "Stripy Throw"